From the blue side: Thousands of Meters Below The Ice. Thousands of Meters Below The Ice. For those that don't know neither me nor the blog, I will take advantage that I wrote this post for the blog of the GEO journal and of the institute where I work (AWI blog), and I will present myself again. My name is Raquel Somavilla and I’m an oceanographer. I work at the Alfred Wegener Institute (AWI) since one year ago, and I live in Bremerhaven although I’m Spanish. I’m studying at AWI the deep water masses of the Arctic Ocean and the Greenland Sea. Maybe it doesn’t sound very exciting, but don’t trust in the appearances. Why should we care about the deep water masses of the Arctic? Well, most of you probably know about the high vulnerability of the Arctic to climate change due to among other reasons the big changes in sea surface temperature or ice cover that are taking place here. However, the importance of the Arctic not only resides in the surface. Few things are known about the changes that could be taking place in the deep waters (until 5000 m. depth), because for a long time the deep Arctic Ocean has been considered imperturbable to the remaining changes observed in the surface. Besides, in the Arctic Ocean and Greenland Sea, deep water formation takes place. This is a very important process for our climate, because these waters that sink to the bottom are substituted by warner waters coming from southern latitudes at the surface. Without these movements of warm waters at the surface from the Equator to the Polar Regions, and cold waters at the bottom from the Poles to the Equatorial regions, the low latitudes would become warmer and warmer, and the high latitudes colder and colder. This is one of the ways in which the deep Arctic Ocean and Greenland Sea contribute to the regulation of our climate, and for this reason the changes in their deep water masses are very important. What are the causes of these changes? Well, the changes in the deep water masses of the Arctic and the Greenland Sea have the origin in processes thousands of meters above and thousands of kilometers away. It will take me a little while to explain how, but if you read until the end you will understand. Fig. 1. Map of the Arctic Ocean and Greenland Sea and temperature and salinity measurements in these ocean basins (see text below for further explanation). (Source: Raquel Somavilla). In Fig. 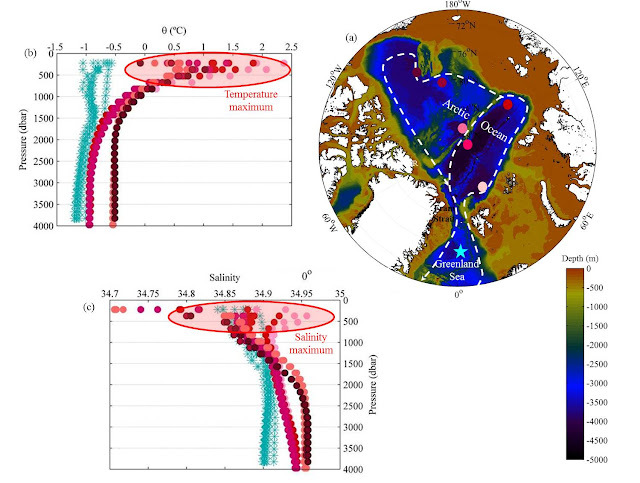 1, I show you a map of the Arctic Ocean and the Greenland Sea including temperature and salinity data measured in these ocean basins (To know how we measure temperature and salinity in the ocean you can read this previous post). In the map you also see a white arrow. It represents an important current entering the Greenland Sea from further south in the Atlantic; then, in the Arctic Ocean through Fram Strait; and flowing all around the Arctic until its exit again through Fram Strait towards the North Atlantic. The maximum representation of this current is the flow of Atlantic water that you can identify all along the Arctic through a subsurface temperature and salinity maximum (they are the shadow areas that I mark you in the temperature and salinity vertical profiles in Fig. 1 b and c). What does this picture tell us about the Greenland Sea and the Arctic Ocean? The main feature of the Greenland Sea that we can infer from Fig. 1b and c is that temperature and salinity are quite homogenous from the surface to the bottom (4000 m.) in comparison with the Arctic Ocean. It is the result of a process known as open ocean convection which is a very effective mechanism of mixing due to the strong cooling during the winter months. Why is the water column in the Arctic Ocean different? Because in the Arctic the presence of the ice and fresh water in the surface enhances the stability of the upper layer and deep convection, as occurs in the Greenland Sea, cannot take place. What more things do you notice in Fig. 1? I suppose that the presence of warmer and saltier waters in the deep Arctic Ocean, further north than the Greenland Sea, could result an odd feature. What are the reasons for that? I explain below, but first I need to leave you another figure. Look at it while you read the next paragraph. Fig. 2 Processes of deep water formation in the Arctic Ocean. (Source: Raquel Somavilla, AWI). During the winter, very, very low air temperatures occur in the Arctic. 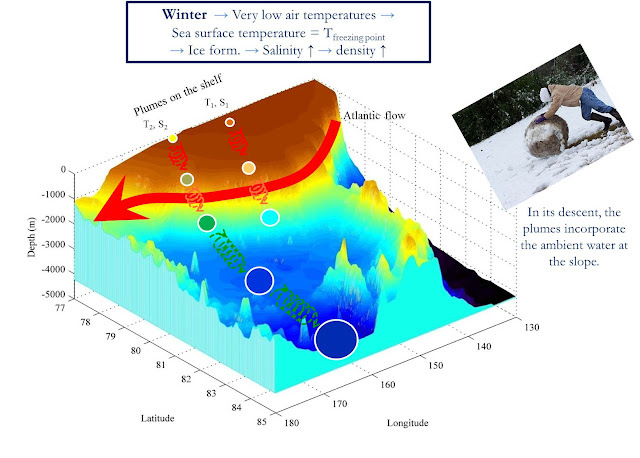 The sea surface temperature decreases until the freezing point and ice formation takes place. The ice cannot incorporate the salt present in the sea water, and so when the ice is formed the salt leaves the ice increasing the salinity and density of the surface waters. The ice formation mainly takes place on the Arctic shelves. From there, these denser waters created on the shelves (plumes) will deepen in the water column until its density equals that of the waters at the same depth. Similar to a snow ball, the volume of the plumes increases as they ‘fall’ down the slope, because they incorporate ambient water in their descent, as the scheme in Fig. 2 shows. To understand how this works, we can imagine a black snow ball falling down a white mountain. As it descends, its volume increases getting lighter, and lighter grey, because it takes white snow from the mountain, while the mountain also results darker. The water that our ‘snow ball’ takes from the mountain (slope) belongs to the flow of Atlantic water that we already know. We also have seen that the Atlantic flow transports warm and salty water. Thus, our ‘snow balls’ falling along the slope in the Arctic take part of the heat and salt in the Atlantic layer and transport it to deeper levels. It explains why as we move into the Arctic Ocean following the white arrow in Fig. 1 (dots pass from pink to dark red in the map and in Fig. 1b and c) the deeper waters become warmer and saltier while the Atlantic flow becomes colder and fresher. So, I hope now you understand why the origin of the deep waters in the Arctic and Greenland Sea is in surface processes; in water that comes from southern latitudes in the Atlantic; and that any change that they provoke in the deep waters of the Arctic and Greenland Sea will have the potential to affect our climate. I find the understanding of the physical mechanisms linking all these processes at different compartments in the ocean climate really exciting, and I feel lucky that my research may contribute to it. However, we didn't take only measurements of the deep water masses of the Arctic during our cruise. We did a lot of things. In previous posts you have more information about that. Below, you have some nice pictures of our cruise in the Arctic. I know sometimes they are the best part of a post ;-). I hope you like it.